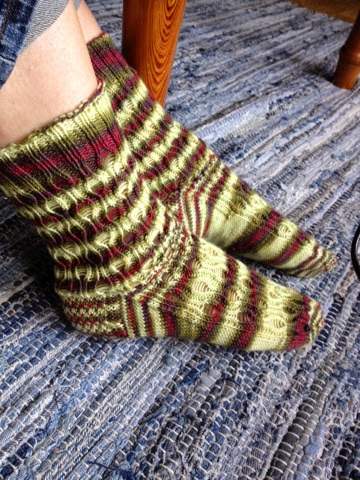 twelve moons of gratitude: Zombie socks finished! My sons zombie-socks (pattern available for free on Ravelry) have been finished for a while now; I love how the yarn stripes quite randomly. Son loves them too; wonderfully soft (Shepherd sock from Lornas laces, it will be interesting to see how durable this soft yarn is). Grandpa was quite puzzled; why knit socks with lotsa holes? The pattern is lovely, easy to memorize and adds a lovely elasticity and good fit to the sock. Will make in a solid or semisolid colour too!